We offer a variety of Commercial Drive Thru Systems as well as provide quality repairs on all equipment that we sell. Effective communications are crucial to the success of your drive-thru business. To operate at your best production, you need reliable equipment. Functional Communications and Mood have got you covered. 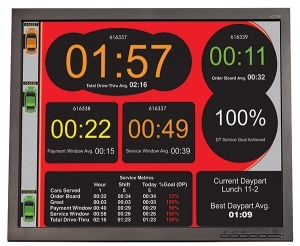 QTimer® is the leading real-time drive-thru management system from HyperActive Technologies® and is the ultimate tool for the quick-service restaurant (QSR) drive-thru looking to shave seconds off their drive-thru.